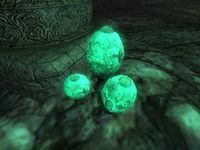 Watcher's Eye is a bulbous root native to the Shivering Isles, found in the cave systems of Dementia. 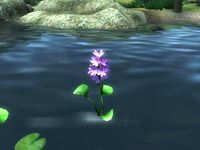 The Water Hyacinth is a pink flowering aquatic plant, sometimes found near Sacred Lotuses. 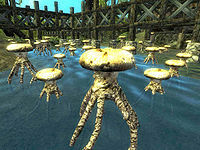 It grows in almost any body of water across Tamriel. 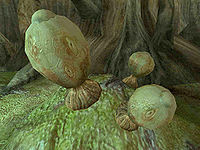 Water Root Pods are creamy colored plants native to the Shivering Isles, growing out of the beds of water in the Dementia region. 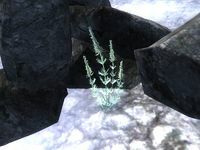 Watermelon vine is a leafy plant found growing on several farms in Cyrodiil. 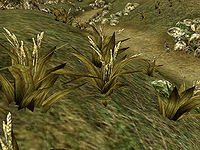 Wheat stalk is the tall, thin golden colored plant found on many farms throughout Cyrodiil and Skyrim. 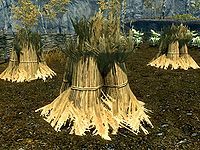 Wickwheat is a wild Ashland grain with modest magical properties that grow in the Grazelands of Vvardenfell. 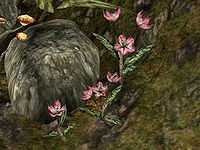 Willow flower is a pink flowering plant found in the Ascadian Isles and on Azura's Coast. 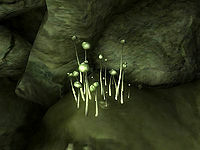 Wisp Stalks are tall, thin, white mushrooms that grow inside caves and ruins in small clusters. A purple variety of wisteria arranged in a windowbox, in popular Summerset fashion. 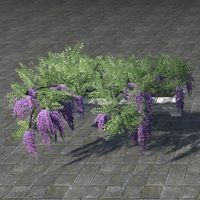 Wisteria is a flowering plant adored by the Altmer of Summerset in decorative window arrangements. Coming in purple and blue varieties, the flowering plants drape from leafy green brush. 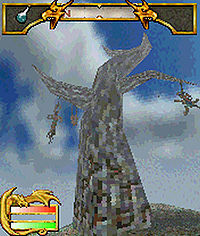 The Witch Tree is a mysterious sentient tree found in Ghast's Pass in Hammerfell. For more information, see the main article. 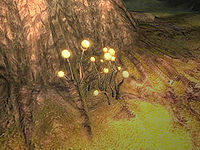 Withering moon plants are the bright glowing plants native to the Shivering Isles, found in the caves of the Dementia region. 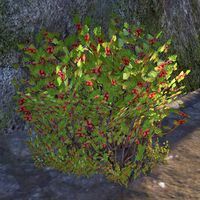 Wolf's Woe is a bush with small red flowers which can be found growing in Glenumbra. When the plant is crushed, it produces a odor which scent-sensitive creatures like wolves will actively try to avoid. 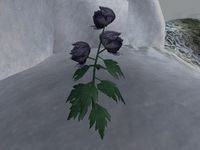 Wolfsbane is an incredibly rare, strong-smelling flower found on Hvitkald Peak in the Moesring Mountains on the island of Solstheim. It is heavily associated with lycanthropy, and is sometimes used as incense. 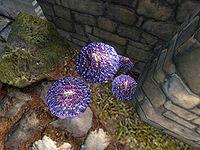 Worm's Head is a purple capped mushroom found in the Mania region of the Shivering Isles. Wormwood is a scraggy plant that grows sparingly throughout high elevations and the Jerall Mountains in the nooks between rocks. Wrathberry bushes grow in the snowy regions of Wrothgar. The berries that grow from these bushes have a filmy white skin and red center. Wrathberries are said to be similar in taste to snowberries, but sharper. Wrathberries are sometimes used in Orcish cuisine. This page was last modified on 8 January 2019, at 21:27.